CeraVe Skincare products help restore and maintain the skin barrier — the skin’s natural protective function. It is the only skincare line with unique, patented Multivesicular Emulsion (MVE®) delivery technology which used to be available only in prescription formulations. MVE® provides multiple layers of skin-nurturing and protective ingredients to the skin slowly over time, ensuring that the essential ceramides, hyaluronic acid, and emolients found in CeraVe Skincare products penetrate deeply into the skin to hydrate and nourish it. The CeraVe Skincare line includes six elegant yet affordable formulations, ideal for your daily skincare regimen. 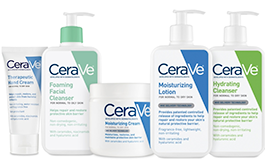 All CeraVe Skincare products provide the benefits of MVE® delivery technology and are formulated with essential ceramides and other skin-nurturing and protective ingredients—including vital humectants and emollients—to replenish and retain needed moisture.